This is all I had time to do yesterday between wash, spoiled dog and family. 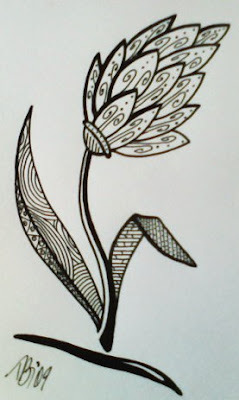 Thinking that this is a zenflower....obviously, of my own botanical design! I may be framing it in one of the 5x7 cute brightly colored frames and put it in my art stockpile. The entire rest of my week has some sole dog duties and that limits me a bit but we'll see how it goes. Rain again today...took more cloud photos taking VolleyGirl to school. Thinking I may start participating in Friday's Skywatch. And sometimes black and white is just plain beautiful! Good idea to frame it. Too pretty not to. Another lovely Zen. You do such good work on these and you just..whip them out. I love it. this is great, now you have started 'blooming tuesday' too. look forward to seeing you on swf. hey any photos of apollo being bathed? what a mess, i remember with our bullies....we used to bath them in our swimming costumes, cos when they shake the water off, they shake!! Thanks for the compliments on the zentangle all. Lolo, Dudley knows he's a stud! He is actually a Blue Ragdoll. He's trying to stir up support for a cat day I think. Soul..my son gives Apollo his baths, I will see if I can get you a wet n' wild photo of him next time! Very pretty indeed...black and white always looks good! That zentangle is well worthy of framing, AU - Definitely, so's that beautiful kitty cat - What a treasure! And those billowing clouds, very very cool - and nice to see how the weather builds out where you live. Your art looks fascinating. I'd love to see more of your paintings. "Just" beautiful. Simply complex. Worth framing. 'Nother cute zen. Love it. Reminds me of a William Morris design. Very nice! Your black and white drawings are very interesting - it shows different side of your creative mind. I like it, simple yet detail. like the name - zenflower. and love the actual drawing. I like that very much. I can see an opportunity opening up for you as an illustrator. Cool drawing... love the clean lines. I love the perfect clean lines of this!